WASHINGTON (Jan. 13, 2009) -- The Army accepted it's first six "neighborhood electric vehicles" during a ceremony Jan. 12 at Fort Myer, Va. 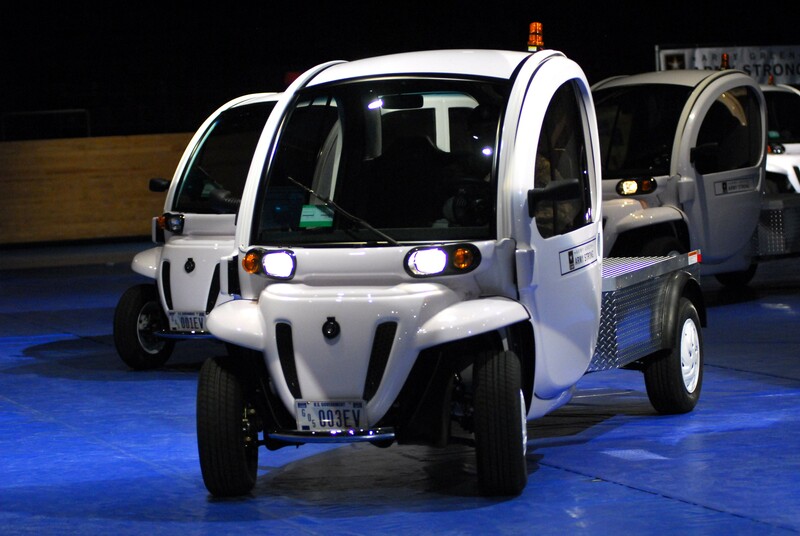 Delivery of the six tiny battery-powered NEVs, each about the size of a golf cart, represents the beginning of a leasing action by the Army to obtain more than 4,000 of the vehicles. The first six "neighborhood electric vehicles" were delivered to the Army Jan. 12 during a ceremony at Fort Myer, Va. The ceremonial delivery of the NEVs, which are entirely electric powered, represents the beginning of a leasing action by the Army to obtain more than 4,000 of the vehicles. The use of NEVs by the Army is part of its comprehensive and far-reaching energy security initiative to ease its dependence on fossil fuels. As part of that initiative, the service will be leveraging electric vehicles and other technologies that exist today, as well as exploring emerging technologies. Secretary of the Army Pete Geren said the service will receive a total of 800 NEVs in 2009, and an additional 1,600 of the vehicles in both 2010 and 2011. The vehicles will help the Army save money in both vehicle purchase and in fuel savings, he said. Though there will be a small cost associated with installing infrastructure to charge the vehicles -- about $800,000 total -- that cost will be eclipsed by the savings, he said. "It will be offset multiple times by the reduction and consumption of 11.5 million gallons of gasoline over the six-year life of these vehicles," Geren said. "And this acquisition of 4,000 NEVs will allow the Army to meet 42 percent of the 2007 Energy Independence and Security Act requirement for a two percent annual petroleum consumption reduction through 2015." The Army's acquisition of the NEVs constitutes not just the largest acquisition of electric vehicles for the military, but also the largest acquisition of electric vehicles in the United States, Geren said. "The importance of today's roll-out of the NEVs and my involvement, is to show industry that the Army is serious about reducing energy consumption, increasing energy efficiency, (and) exploring alternative fuels and energy, while creating a culture of energy awareness throughout the Army," Geren said. The acquisition of the NEVs also helps the Army "go green" by preventing the release of some 218.5 million pounds of carbon dioxide into the environment, the secretary said. The initial contract for 4,000 leased NEVs will cost less than the gasoline-powered vehicles they replace -- $3,300 less than a gasoline powered sedan, for instance, and $13,000 less than a hybrid vehicle, Geren said. For now, the Army plans to lease as many as 4,000 of the NEVs through the General Service Administration. The GSA has placed an announcement on its Web site, FedBizOps.Gov, to solicit additional manufacturers for the vehicles. The NEVs will be used to replace non-tactical vehicles only, Geren said. "The Army operates almost 68,000 non-tactical vehicles," he said. "Approximately 28,000 of those are sedans or light trucks -- these vehicles are good candidates for replacement by additional or other varieties of electric vehicles." The first of the NEVs have been manufactured by the Global Electric Motorcars division of the Chrysler Corporation. The vehicles come in several variants, including passenger vehicles and cargo-carrying vehicles -- the largest of which carries a payload up to 1,450 pounds. The NEVs are street-legal in nearly all 50 states on roads with speed limits of 35 mph or less. The cars can travel approximately 30 miles on one eight-hour charge, and according to a GEM press release, the comparative per mile fuel cost is about two cents. "We're going to save a lot of energy with these," said Lt. Col. Cameron A. Leiker, garrison headquarters command, battalion commander at Fort Myer. "I can imagine seeing these with boxes on the back for guys that do repair work on post. You know there's a lot of places you can go with 30 miles on a post like this."